This year's MRO Americas conference is running from April 9th to April 11th at the Georgia World Congress Centre in Atlanta, USA. The conference’s specific focus is on commercial aircraft maintenance and technology solutions for this sector. 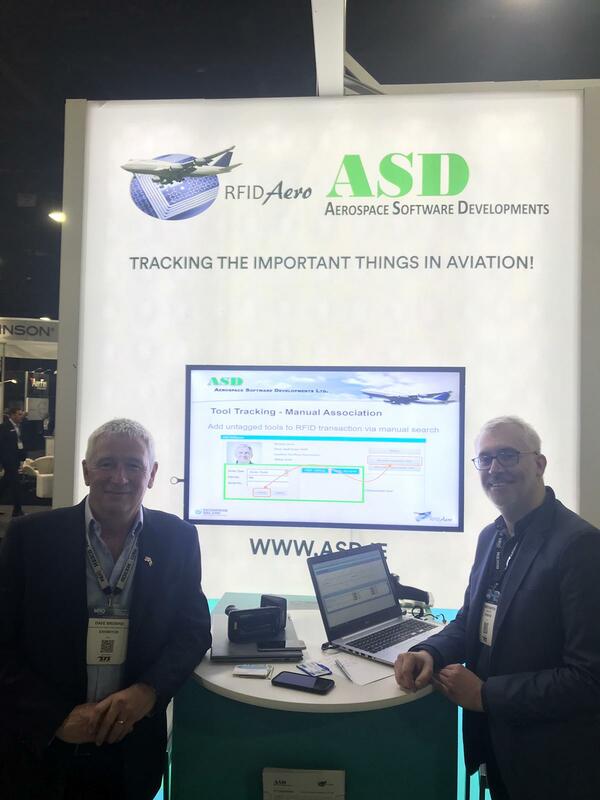 ASD specialise in the development and implementation of mission-critical applications based on the latest RFID technology which are specifically designed for the Aerospace and Aviation market sectors. ASD's solutions are standards-based, GS1-Certified, and SPEC2000-Compliant. We'll be at stand 1247 and are ready to give you a demonstration of our RFIDAero Solutions, including RFIDAeroCheck which is a complete solution for airlines that allows for the tracking and management of all rotable and other life-limited components on board the entire airline fleet. RFIDAeroCheck contains a new dashboard feature that allows enterprise data to be presented in a graphical format which allows for easier interpretation and quicker decision making. RFIDAeroTrack tracks and monitors the movement of items that are RFID-tagged within a fixed-reader environment or with the use of RFID handheld scanners. Information for all tracked items is stored centrally on an RFIDAeroTrack server ensuring all data, for all RFID-tagged items, can be shared both internally and externally with the relevant personnel. The handheld solutions within RFIDAero now support iOS, Andriod & Windows and are available on numerous devices including handheld computers, smartphones, phablets, tablets and tough pads. A new GUI has been added to show cabin locations when scanning for equipment on board the aircraft. If you’d like more information on our RFIDAero suite of business solutions, please contact Dave Browne or James Marston at +353 1 2060011 or at the email address below.